Well, I’ve been wanting to post this for several days but have been caught up in other things. I also thought nominations closed November 28th, which they actually close November 26th but I’m hoping they’ll take a one day late post. And even if they don’t, this is a good exercise in sharing resources! So here are my nominations for the 2012 Edublog Awards. 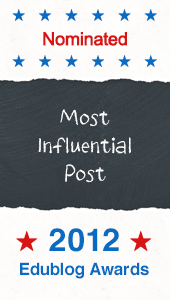 Best individual hashtag: Obviously I’m going to pick the #slpeeps tag, since it has been extraordinarily influential in my own life and the lives of many other professionals. It has unified a profession across the globe and across populations with whom that the profession (SLP) works. Best New Blog: I would have to say that Mary Huston’s Speech Adventures is my favourite new blog. The Twitter community hassled her to have a blog for years and now that she has, it has been very enriching. Best Group Blog: I like ASHAsphere for this category. They have many different contributors and post great information on a regular basis. Best Individual Blog: I love Aubrey Klingensmith’s blog Speechie Apps. I have often read her reviews of apps and used this information to decide if I should try one or suggest it to others when I am (frequently) asked. She even does Android app reviews, which I don’t use but I know many who do and want this information. Best Individual Tweeter: I like @pediastaff for this category this year. Not only have they been tweeting great content for multiple professions for years, they performed a giant undertaking in funding a Social Media Learning booth at the ASHA conference this year, in order to teach others about social media and how it ca help their professional growth. Many people helped out at the booth and behind the scenes but organizing it and having the idea to do it deserves major kudos. There are so many other great people out there but these are the categories where I felt compelled to nominate this year and just some of the people contributing to my PLN right now. 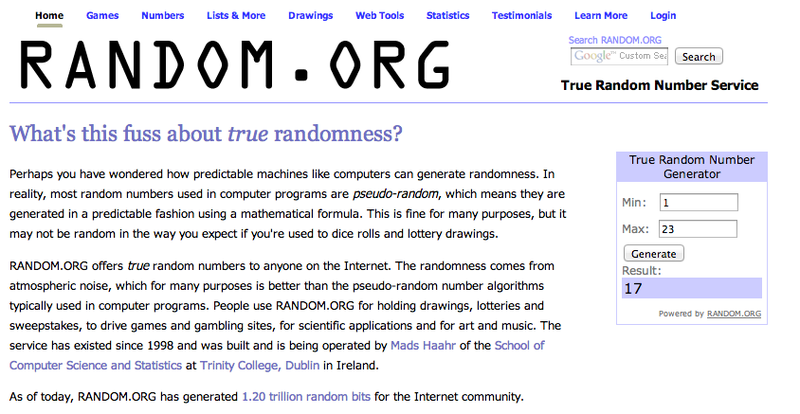 Well, I woke up early this morning so I went to a random number generator and drew a winner. There were 12 participants and a total of 21 entries (remember, I enter you every time you tweet). I suppose the law of averages works nicely when there’s a small sample size, cuz the winner is one of two who tweeted the most times *insert drumroll here* @alour! Ashley tied for the most tweets/entries (5) with @dibsondebs so I shouldn’t be surprised, but I still was! Congrats, Ashley – I’ll be in touch to get your address to mail you stuff and give you the code today. Thanks to everyone for participating. Here is a Chirpstory of the tweets during the contest. mournful, dismal, or gloomy, especially in an affected, exaggerated, or unrelieved manner. I really wanted to go to the ASHA conference this year, but it wasn’t possible. I’m hoping to go next year, but in the mean time I’ll content myself reading the tweets and watching the goings on of all the #SLPeeps who are there in real life, like I have for the past 2 years. I know many of you are also ASHA-less – unable to attend this year and also sad about it. To cheer us all up, I’m going to have my first blog giveaway ever. And it’s only for those of us who aren’t at ASHA this year. Don’t worry ASHA attending folks, you’re going to have plenty of giveaways and contests while you’re at ASHA. Actually, anyone can participate, but only those who aren’t at ASHA can win a prize. If you want to be included in the draw you must include the hastags #SLPeeps and #ASHAless and a reason you love some online community of SLPs – it can be twitter, pinterest, blogs, Facebook, LinkedIn – whatever! But you have to have those 2 hashtags in your tweet to qualify to win (and most importantly so I see your tweets and can enter you in the contest). 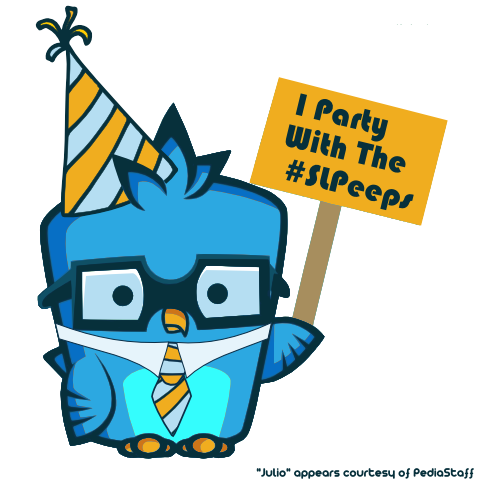 If you are going to attend ASHA this year, you are welcome to also tweet why you love the #slpeeps and include the #ASHA12 tag – I’ll include your tweets in the chirpstory I make later (you knew there had to be a chirpstory at the end of this!). However, you have your own contest at the Pediastaff Social Media Learning Centre featuring #SLPeeps. Don’t miss the 3 Tweet and Greet times where you can record a video of yourself and be entered to win a prize. See here for how. Prize drawing for non ASHA attendees will be random, but I’ll put your name in as many times as you tweet reasons – upping your chances to win. The contest will run from today until the end of Saturday, November 17th. The draw will occur on Sunday, November 18th. At this point there are 3 things up for grabs: a digital copy of the movie Rio (such a great movie), #slpeeps swag of your choice (more or less), and a copy of the Profile of Phonological Awareness app. I’ll keep you posted if anything else is on the table (e.g. gets donated). Wish there was an app for that? Write it yourself! 1. to plan with ingenuity; devise; invent: The author contrived a clever plot. 2. to bring about or effect by a plan, scheme, or the like; manage: He contrived to gain their votes. 3. to plot (evil, treachery, etc.). 4. to form designs; plan. If someone had told me in 2009 that I would author apps, I would have told them that wasn’t possible. How could I write an app? I didn’t know how to code them or how to get them on the market. I was an app user – just wishing there was an app out there that could do this, that, or the other thing for me; until I got on Twitter. When the #SLPeeps first formed, there was an explosion of sharing thoughts, ideas, and resources, as I’ve blogged about before. One of the things that came of it was the #SLPeeps Shared Folder on Google Docs (now called Google Drive – thanks to Shareka Bentham (@speechreka) who created folders initially). As a part of this sharing process, we decided we wanted a repository of common goals we use and discuss – to make it easier to share our goals with others. Janelle Albrecht (@albrechtjn) set up the SLP Goal Bank to fulfill that goal, and it still exists. A little before this, Barbara Fernandez was busy writing some of the first SLP specific apps with her company, Smarty Ears Apps. I knew about her, sometimes interacted with her, and watched her company and apps with interest. She approached those of us who had first started the SLP Goal Bank to write an app with our own goals. It all happened extremely fast but suddenly I was a co-author for an app! I just sort of fell into it by accident and found the process very interesting. However, for that app, all I had to do was contribute a bunch of my own goals to various areas of speech pathology – I didn’t have to do any lay-out or trouble shooting. I couldn’t even test the app because I didn’t yet have an iPad at that time. This process got me thinking, though – what if I could write an app that was missing in my life? I now knew a little bit about how to write it while working with a designer/publisher and realized it’s as ‘easy’ as writing a book (and I actually did have to write a book for my app, but most people wouldn’t need to do that). 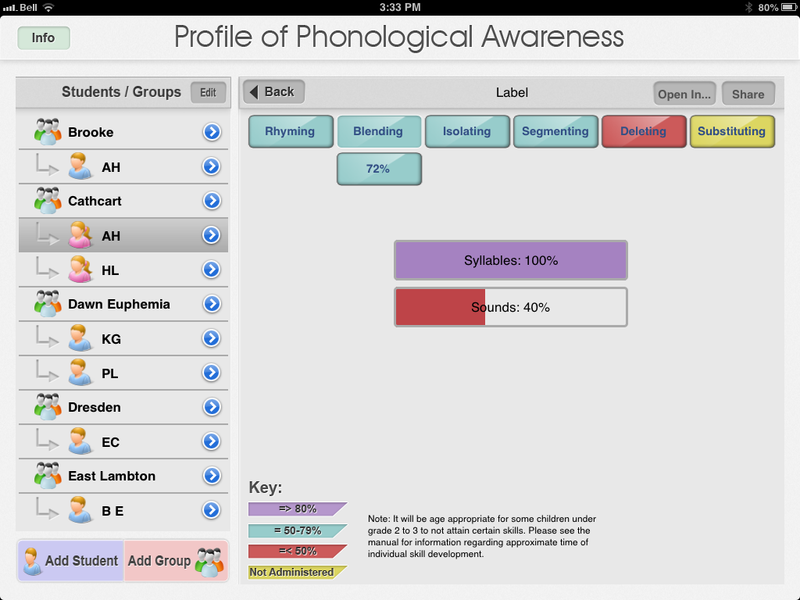 As it happens, what was missing in my app life was a phonological awareness profile. I had grown weary of the CELF-4’s screener1and was screening kids with it more or less daily. So, in the summer of 2010, I started thinking about what I would want a phonological awareness assessment app to look like and do. I contacted Barbara at Smarty Ears, who loved the idea, and then I started working on it – SLOWLY. I started by writing the profile the way I wanted it; touching on the major areas and skipping the not so major areas that contributed to the length of the screener I was currently using. I fleshed out things I wished I could speak to better, like segmenting consonant clusters. I spent quite a bit of time (months) choosing words that target a variety sounds and word lengths, as appropriate, and aren’t too similar to other sounds/words in the same subtest. I took time to organize the profile items into a more or less developmental progress, but by overriding type, and decided not to create a criterion score. This was so that there’s no worry of false positives/negatives and so that sections of the profile can be skipped as an educator sees fit depending on age and reassessment status. There’s nothing worse than feeling obliged to administered several subtests you know the child can/can’t do (or shouldn’t be able to yet do) just to get a criterion score. I then put the whole thing into a pen and paper screen and passed it out to several of my friends globally as well as my own colleagues, to test it out on real kids and get feedback on items that failed consistently or anything that didn’t work. Then I spent several months refining the screen. I should note here that I didn’t go into designing my own profile out of nowhere – assessing PA skills in children and setting goals to target these areas is something I do daily in my practice. Also, my graduate thesis was on early literacy skills, and I sit on a committee to organize a literacy workshop every year, in which I often present as well. I’ve read and done research in the area and I looked to current research and my experience when writing the app. I worked on the concept in my head for a while but, basically, I spent the better part of 10 months writing and organizing the content of the app. THEN I wrote the app structure and lay out, which took me a month or so (working on it bit by bit and after many months of considering the app layout in my head as well). I did my mock up in Power Point, making each slide a different page from the app. This went beyond mocking up how it would look, though. I also had to think a lot about lay out and functionality in terms of navigating the app in the simplest way possible. When would I need to get to various menus and pages inside the app? When might I need to get out of them again? How will the app progress? How will I input various things such as success or failure of items, make notes about the items, or enter client names and information? For that matter, what client information is most important to include and why? Actually, given the type of app I was authoring, the lay out for the ‘test’ portion was the easy part – the part that was most difficult was the menu. Up until that point, other apps like mine displayed only one client at a time, but I wanted to be able to organize by groups (e.g. 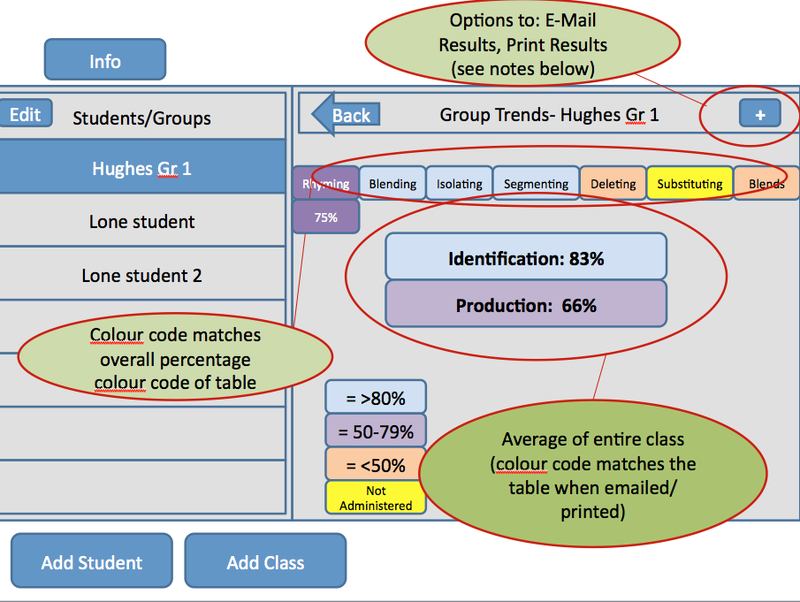 class, school, etc) and also have the results available by group (e.g. an entire class) to help direct where the group generally needed to go next, but not losing the information for individual children. How to lay it out best? This is when I went to Barbara and proposed what I wanted to do and how I thought it might work, but she and the programmer might have had other ideas how it could work with the programming options available. Barbara and I spent a while discussing it via email, Facetime, and Skype to flesh it out better so that she understood what I wanted and could give ideas based on how apps are written/function. She was also able to foresee some things I hadn’t fleshed out because of my inexperience in writing apps, which was very helpful. Once I had the app laid out and submitted to Smarty Ears to code it, I then had to write the manual from start to finish. This was also a rather large task, but most apps wouldn’t require such a hefty undertaking. We then beta tested it (used the app to work out bugs and issues) and it was submitted to iTunes. From my first ideas of the concept, to its’ being published in January 2012, I spent about 18 months on this app. I could have written it faster, but I work full time and have a family I like spending time with, plus I’m a big perfectionist when it comes to these kinds of things. One thing I learned through this process is that you need to think through every possible functionality or navigation of the app from the start. I mean VERY specific and detailed. I got most of them, but forgot to highlight the idea that the profile can be stopped at any time with skipped sections. I had thought through colour coding yellow in the results to indicate that a section had been skipped, but not how to quit the ‘test’ portion if you don’t want to do the final section(s). So the programmer coded the app (initially) so that it only finished the ‘test’ and went to the results once you administer the last section, which is how other apps had worked (like the Sunny Articulation Test, for example). This was a pretty big oops for my app functionality, but to change it and add a ‘finish test’ button, or something like it, the programmer would have had to reprogram the entire app from the ground up again, which would cost too much money. This was a detail I didn’t know going in, since I’m not an app programmer. So, I had to live with the app saying that a child scored incorrectly on the final section (substituting final sounds) for several months until the programmer could redo the app over again. I’m happy to say that it’s been fixed now, but I had to be patient for that part. My advice (to myself if I write any more apps) is to take the extra time and energy to visualize and think through the entire app – every single page possible. Visualize the app as it’s being used and ask: If I’m doing this in the app, what might I want/need? How will I build the app to allow this to happen? What ELSE might I want/need? Going a little more slowly can pay off a great deal in the end and ensure a very well designed app of which you can be proud. Not that I could have gone much more slowly last time, mind you – there will probably always be that one thing that you didn’t foresee. That’s just life, though2. You can choose to find someone who knows how to program apps and strike some sort of bargain with them or pay them outright. I know a few SLPs who have done this but I chose to go with a publisher. It’s basically the same as going with a publisher of a book, versus publishing it yourself. If I had tried to publish this myself I would have been in charge of: getting it made (programmer fees), submitting it to iTunes (small fee – learning curve), updating it regularly (more programmer fees), and advertising it. So I made the trade off of not making as much percentage per sale for not having to front a bunch of expenses and time and not have to worry so much about advertising. I’m fairly confident that I’ve come out ahead with my choice. I didn’t write this app for the money, I wrote it so that I could use it in my daily practice. However, I couldn’t have fronted a rather large programmer bill to get it made and risk not making that money back on the sales. Nor do I have the time or ability to properly advertise for an app to be able to make back those various fees. Not to mention recompense for the considerable time I put into the app authorship – my time is worthwhile too. I specifically chose Smarty Ears Apps because I had experience working with them before, I knew Barbara from Twitter and had a relationship with her, and she is the biggest app developer for SLP related apps on the market (even though mine is for SLPs and Educators alike – I know lots of educators use her apps as well as SLPs). Is there an app you wish you had that doesn’t yet exist? Maybe you could write it for yourself, and other people might like it too. Have you authored any apps? Please drop a comment to share any similarities or differences you had from my experience and any tips you think helpful for others who might author their own! 1 – I want to say here that the CELF-4 PA skills criterion referenced screen has served me very well over the past many years. There’s nothing inherently wrong with it, it’s actually a vey good tool and very thorough. I just wanted/needed something faster. On the CELF-4, there was no way around giving every item in a section, regardless of the child being clearly unable after the trials, which is painful for the student as well as for me as the assessor. Also, it is typically ‘forever’ before you reach the ceiling, making it even longer to administer. Finally, I would frequently use it on a grade 2 or 3 who could do lots of things, but couldn’t identify or produce rhyme at all. These students would typically ‘pass’ the criterion score, but clearly had difficulties that were not age appropriate, and could cause a lot of grief working on word families and other reading/writing techniques. Obviously I would write appropriate goals and recommendations based on this piece of information, but it looks odd to parents and teachers when a student ‘passes’ a test and is still told there’s work to be done. 2 – Like when I put I-don’t-know-how-many thousands of hours into my graduate thesis, only to see a type-o on the first page I flipped to when I finally got my bound copy. Somehow, I, and about 6 other people, missed it but of course I found it within the first minute after it was printed.